The week went by SO fast! I can't believe it's over already. I've been thinking I might make it two weeks next year, if enough people are enthusiastic about it. So, weigh in when/if you leave a comment. 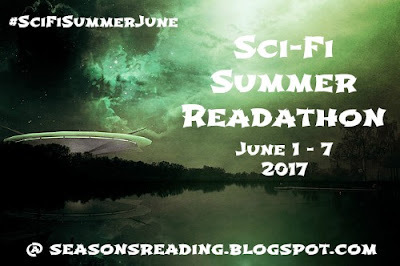 I hope everyone enjoyed the readathon and that you were able to get some good SciFi (or fantasy) reading in. I'd like to thank you all so much for joining me. Be sure to add your wrap-up link below and please double check that your name is listed in the sign up/starting line linky at this post so you will be eligible for the giveaway. You will also need to leave a comment on the Midweek Check In post (with a way to contact you if you win), if you haven't already. You have until Saturday, June 10 by 11:59pm CDT to add your wrap-up link and leave a comment on the post mentioned above. I will email the winners within a few days following the deadline so keep a look out in your email inbox (or spam folder, just in case) for an email from truebookaddict AT gmail DOT com. 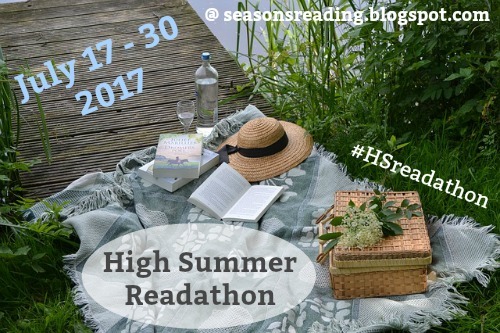 Hope to see you next time at the High Summer Readathon, coming in July (17 - 30). Sign up coming soon! I've created the button (below) and will be adding a grab code in the sidebar soon. Also, in case you didn't hear in the Facebook group, there is going to be an extra special event during High Summer this year. The final weekend, on July 29 and 30, we are having a 48 hour Christmas in July Readathon! I don't know about you, but I'm a Christmas fanatic (I guess my year round Christmas blog gave me away 😉) so I'm pretty excited about this! I will be creating a special button just for it soon so keep a look out here or in the Facebook group. That's it! Thanks again. I do hope you had fun...and good luck to those who enter the giveaway! 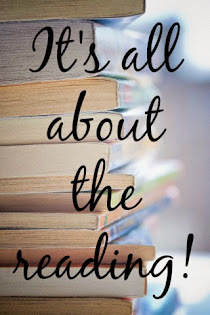 Read-a-Thon dates: Thursday, June 1 at 12:00am CDT until Wednesday, June 7 at 11:59pm CDT (adjust your time zone accordingly). as usual, you do not have to have a blog to participate...feel free to link up and check in from Goodreads, Facebook, Twitter, etc. These days, it seems most of our activity goes on in our Facebook group which I love. We have such a great community over there! I'm offering a couple of prizes. Our mid-week check in on Sunday will also be the prize page this time out.